This morning, the Birmingham Design Review Committee got its first look at a proposed replacement for what’s come to be known around the city as “The Pepsi Sign.” Representatives from 84 Outdoor and Cayenne Creative presented a working design to committee members at the end of the meeting. City officials reached out to 84 Outdoor by letter (of the cease and desist variety) after learning about the plans to replace the existing vinyl signs covering the electric scrolling installation atop Two North Twentieth via a story published on March 2 by AL.com. They met with them on Tuesday and subsequently added them to this morning’s agenda to give the committee a chance to offer input on its design. It has been just over two years since the advertisement was first installed. (We have a recap of previous reports about appearances by “The Sign” on the Design Review agenda available on Dear Birmingham.) A follow-up report by AL.com’s Kelly Poe said UAB will be paying $300,000 for a one-year lease of the two-sided sign. James Stanley, an attorney with the City of Birmingham, informed committee members the sign is considered a non-conforming billboard for zoning purposes. Based on this designation, the new owner does not have to seek approval of any replacement of the advertising on the sign so long as the sign is not expanded in size and there was no need to replace its structure. 84 Outdoor can choose (as it did) to bring those proposed designs to the committee to seek input and opinion as they are considered, but they do not need their approval for installation. The design as presented this morning has several downtown destinations represented in simulated black and white photos, including the Alabama Theatre; the City Federal building; the Empire Building; Harbert Plaza; Railroad Park; Sloss Furnaces; Vulcan; and the soon to be lit Magic City sign along the Rotary Trail on Southside. A green UAB logo would sit in the middle of it. The design would be closer to what had been suggested by the committee while working with Harbert Realty on what they originally asked to be considered temporary signage more than two years ago. The committee asked the applicants to come back for the next regularly scheduled meeting on March 23 to give them an opportunity to review the proposed design. Unfortunately, the BhamPepsiSign Twitter account doesn’t exist anymore, so the sign could not be reached for comment. As the UAB men’s basketball team prepared to tip-off against Iowa State on March 19 (in a game they ultimately won, 60-59), Alabama State Representative Jack Williams filed three bills aimed at dealing with concerns following the discontinuation of the university’s bowling, football, and rifle teams late last year. All three bills are currently awaiting action from the state house’s committee on education policy. HB 339 would require those serving on university boards of trustees to complete mandatory training on the state’s ethics law, board governance, and accreditation standards including those of the Southern Association of Colleges and Schools. This bill has 63 co-sponsors. Keeps the state superintendent and the Governor as ex officio members. The board would no longer be self-appointing, with the task being handled by a committee consisting of the president pro temp of the board; one member of each alumni association (selected by each association’s board); and the governor (or a designate that is not currently an employee of the system or any of its associated entities) serving as chair. The bill has 41 co-sponsors. HB 341 would require UAB field a football team with adequate funding to allow for competition at the Football Bowl Subdivision of NCAA Division I so long as the Tuscaloosa campus’s Crimson Tide remained active. This bill if passed would make Alabama the only state in the country to require that a football team be fielded for collegiate competition by its legislative body. This bill has 38 co-sponsors. The bills await their debate while the men’s basketball team prepares to play UCLA on Saturday morning (11 a.m. CDT on CBS) or available via live streaming thanks to the NCAA. During the question and answer portion of the December 2 press conference held by UAB president Ray Watts to announce the discontinuation of the university’s bowling, football, and rifle teams, he offered up to those in attendance that he’d stopped an earlier attempt to end the football program for the purpose of conducting what’s now known as the Carr Report. Davis’s reporting also points out how Watts stated the University of Alabama System Board of Trustees had no role in determining the fate of the programs. Those who have come out against the university’s decision are quick to point to the trustees choosing to not take up the issue of an on-campus stadium in late 2011. The board made that decision two months after a report suggested the increased reliance of the member institution’s budgets on tuition and student fees. At the time, Birmingham News columnist Kevin Scarbinsky asked Paul Bryant, Jr. — as part of a pretty extensive exchange originally published on November 3, 2011 — if the on-campus stadium was dead. His response? It’s worth pointing out that UAB had not yet acquired most of the land necessary to carry out the development of the proposed on-campus stadium. It was slated to sit on property located close to Interstate 65 along its eastern edge, with parking located on the opposite side of the road from it and pedestrian access to the site (the horseshoe clearly stands out in the image on this page from UAB Magazine’s website). A look at an article filed in 2013 by then-Birmingham News reporter Evan Belanger suggests there may have been efforts underway to make it time — and ones that could have led to Watts’s statement. Belanger’s February 7, 2013 report, “UA System trustees raise concern over UAB plan to purchase downtown property,” (updated the following evening after the Board of Trustees meeting had taken place) was specifically focused on resolutions for two negotiated land purchases — 11.7 acres at 400 10th St. South and 2.4 acres at 430 12th St. South. 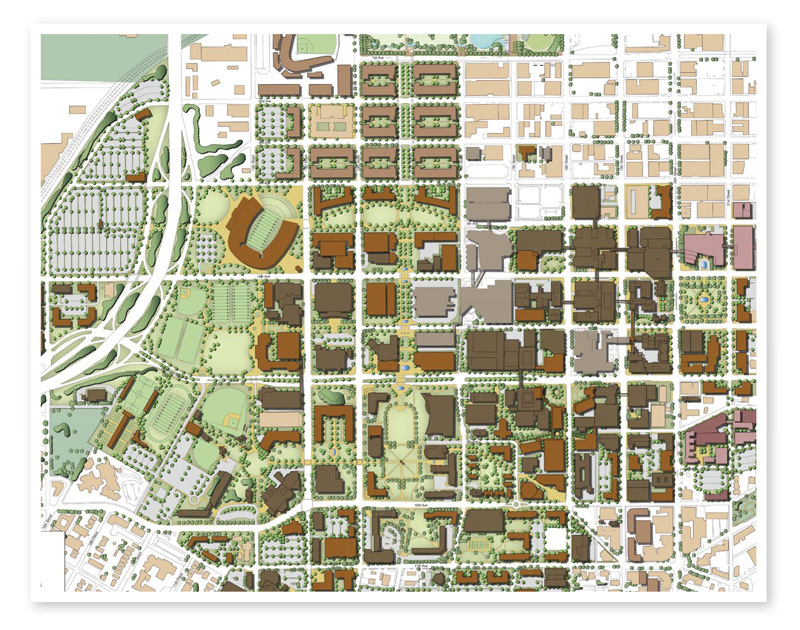 It would do well to click on the links associated with the addresses above and then take a look at the location of the bright green dots on the image below, taken from the UAB Master Plan update proposed in 2011 (and first presented to the board in February of that year). While Belanger did include quotes from concerned trustees, it’s worth noting that neither Joseph Espy III or Finis St. John IV were sitting members of the committee taking up the issue. As is the case with Birmingham City Council committees, all such meetings involving the UA Board of Trustees are open to all members with each having the opportunity to be recognized by the committee chair but not necessarily being able to vote. The photo accompanying the story shows that was most likely the case that day. Both men were, however, members of the athletics, legal, nominating committees at that time according to a site capture of the board’s official website from January 26, 2013, explaining the concerns raised by each in the article. Both items passed the physical properties committee unanimously. The total expenditures approved as a result were $21.5 million — $20.7 total for the two purchases and $800,000 to help the Hardy Corporation relocate and replace equipment as a result of having to move. The cost referenced by Dr, Watts in his announcement on December 2 to invest in infrastructure for the football team was $22 million — a number The Carr Report points out does not include the cost of a new football stadium. The original price range for the entire on-campus stadium project as presented was between $66-75 million. The vote took place the day before the general business meeting of the board of trustees — the day before Ray Watts was named the new president of UAB. The properties were also included on the board agenda (PDF; Page 15 under Real Estate Items) and approved. In other words — the University of Alabama System Board of Trustees allowed the purchase of two pieces of property specifically called out in UAB’s proposed Master Plan update in 2011 for use as a parking lot and an on-campus stadium the same day they hired Ray Watts as UAB’s new president. If one drives by the properties in question (specifically the 12th St. South property), he/she notices most of the surrounding land is now controlled by the university; most of it converted to surface parking lots. An example of what the structures still standing are being used for is the building currently being used by the campus’s Barnes & Noble bookstore. It is scheduled to move into the soon-to-be-completed student center when it is finished next fall, making it available for future development plans. The relocation of Alagasco as the result of the purchase of the 10th Street property eventually led to them purchasing a significant portion of the former TCI Iron Works property along 14th Street and a lengthy battle over the future of the historic freight depot on the site. The resolution of that episode led to the relocation of the depot to Rickwood Field for use as an enclosed batting cage facility. Elizabeth, New Jersey native Joseph Volker adopted the heart of central Alabama as his own when he arrived in 1948 and always dreamed big. He cared greatly for this city and the university he helped found here, having the opportunity to impact both as not only its first president but as the first chancellor of the University System of Alabama. He also never chose to start a football team at UAB while in either of those positions. The first team to ever take the field was approved only three months after he passed away. It’s not an angle many have not focused; most have chosen to focus on what Gene Bartow’s wishes would’ve been for the future of athletics. It only made sense to take a look at things that would’ve influenced Volker’s opinions on the issue — and to “hear” from the man himself. A look at Volker’s previous stops before his arrival in Birmingham (as listed in his Encyclopedia of Alabama entry) helps to start understanding why this may have been the case. He earned his undergraduate degree from Indiana University’s Dental School in 1936 after starting his collegiate career closer to home at Rutgers in 1932. That dental school is now part of Indiana University Purdue University Institute in Indianapolis. It did not start an athletics program until 1972 and, though choosing to go Division I, has never fielded a football team. He continued his education at the University of Rochester, earning A.B., masters, and doctoral degrees. Volker would have been exposed to a football team, but not one that gave athletic scholarships. The Yellowjackets currently compete in Division III (though apparently their squash team is a perennial contender in non-NCAA sponsored competition). His final destination before his move to the southeastern United States and what became UAB was Tufts Dental School in Boston, Massachusetts. The Jumbos do field a football team – one significant in the annals of the sport’s history. They are credited with not only playing the first game ever using what’s now known as the “forward pass” in 1875 against Harvard (a game they won 1-0), but for being one of the only schools in the country that does not allow their team to compete in postseason play. This is a strict adherence to the concept of being student-athletes and a reason they chose to become a Division III school when the designation was created in 1973. It also becomes glaring when you realize the 1927 Tufts football team went undefeated at 8-0 (as did the 1934 and 1979 squads); they joined Pittsburgh as the only two squads to do so that year (though Pittsburgh had one tie). Tufts outscored its opponents 218 to 19 that year. For comparison, the 1927 Alabama Crimson Tide went 5-4-1 (3-4-1 in the Southern Conference), finishing in 10th place that year behind a 7-0-1 Georgia Tech squad. There were no divisions in the NCAA at that time. Editors note: There are a few other tidbits about Alabama’s 1927 season to consider as the overall UAB athletics story moves forward. The Crimson Tide only played three games in Tuscaloosa that fall; two non-conference games were at the beginning of the season, winning 46-0 over Millsaps and 31-0 over Southwestern Presbyterian. The only other game played at old Denny Field that season was against the school now known as Mississippi State; they won the homecoming contest 13-7 in front of 7,000 people. They played the rest of their “home” games on the road – three at Rickwood Field; one at the Cramton Bowl in Montgomery; and their last two at their new “home” in Birmingham – Legion Field. Those first two ever home games in Legion Field were losses – to Georgia (in front of 25,000 people) and Vanderbilt (in front of 20,000). Yes, you read that last sentence correctly. By the way, the loan amount provided by the Crimson Tide converted to 2014 dollars is estimated to be valued at north of $4.5 million. The property is now the current home of the Doubletree Hotel on Birmingham’s Southside. It’s also adjacent to the space used recently by the UAB Faculty Senate during the no-confidence process in December 2014 and January 2015. It’s a belief that appears to continue to this day, even in Tuscaloosa, as evidenced in this editorial (pay special attention to page 2) penned shortly after the decision to discontinue bowling, football, and rifle in December. The editorial (as well as the excerpt from the WSJ article above) shows the idea of adding football to change perceptions about UAB, specifically in the South, possibly drove McCallum to allow Bartow to field a team. This is despite knowing the fiscal strain it could place on UAB specifically, and the University System as a whole, as state appropriations to the schools were being reduced as far back as 1987. McCallum was correct when he said the decision to end football was not one normally considered by the Board of Trustees, in part because he exploited that “gentleman’s agreement” policy when he sidestepped them and announced plans to start the team in 1989. McCallum’s concerns are primarily about protecting the autonomy with regard to athletics that he’d carved out with his decisions. Your opinion about whether or not that freedom still exists depends on how you choose to look at the decision to cut the three teams — and whether you believe the conspiracy theory or the numbers in relation to the University System’s current data. It is interesting to note that one of the urban universities often cited when talking about the reasons UAB started a program is the University of North Carolina – Charlotte. Before returning to the field in 2013, the 49ers last fielded a football team in 1948, after only two seasons. When UNC-Charlotte was looking to bring the team back, one of the schools they reached out to was… UAB. The responses shared via The Business of College Sports the day after the UAB athletics announcement were quite enlightening. They implied that issues did arise as a result of the decision to start football and that they continued to exist. As UAB, Birmingham, and Alabama continue to dream big dreams for its future, some will have to determine whether or not it will neglect the lessons taught in its past. Perhaps listening to Joseph Volker would help. CORRECTION, 1.20.2015: An earlier version of this piece stated Volker’s arrival at UAB occurred in 1945. Volker actually arrived in 1948, though the story told during his “The University and the City” speech references an incident in 1945. Special thanks to UAB Archives for bringing the error in question to our attention. 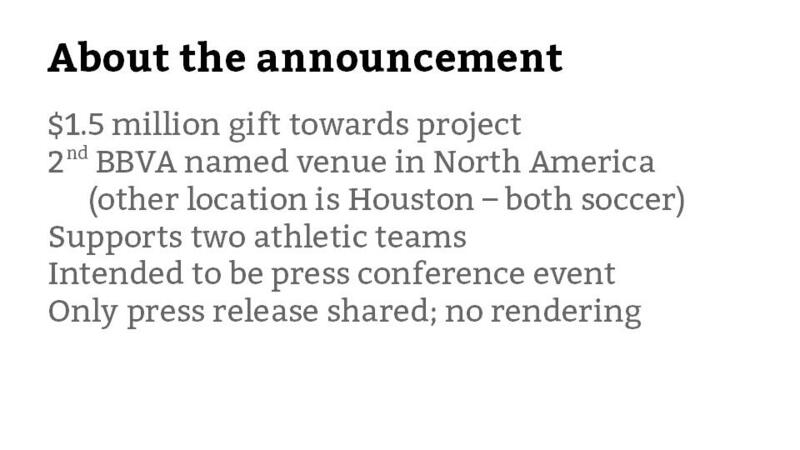 The timing of the events included in the first slide and the significance of the soccer announcement as explained in the second slide (in addition to this report on it as it ran on November 10 — after securing a rendering of the proposed facility) are also significant considering a report from the UAB athletic financial analysis committee on December 19 made available earlier this month as a PDF. At this point, no further work was performed based on the original contract or the two subsequent modifications. UAB reached back out to CarrSports during the week of October 6th to finalize the report. 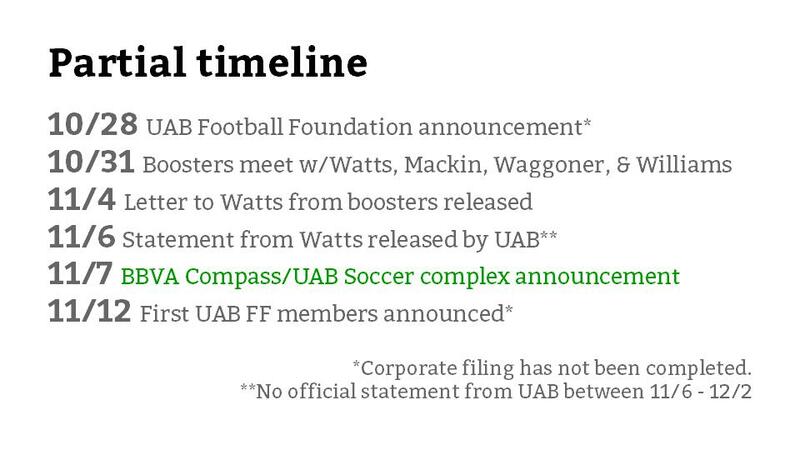 A draft was presented to UAB during the November 7th timeframe, with the final report being issued to UAB on 11/18/14. It becomes significant when you begin to look at who knew what — specifically, the boosters — and when.